Well it is that time of the year again, when the weather gets cool and the rains start moistening the hard dry earth. Mother natures way of preparing to plant one of my favorite root crops, GARLIC! 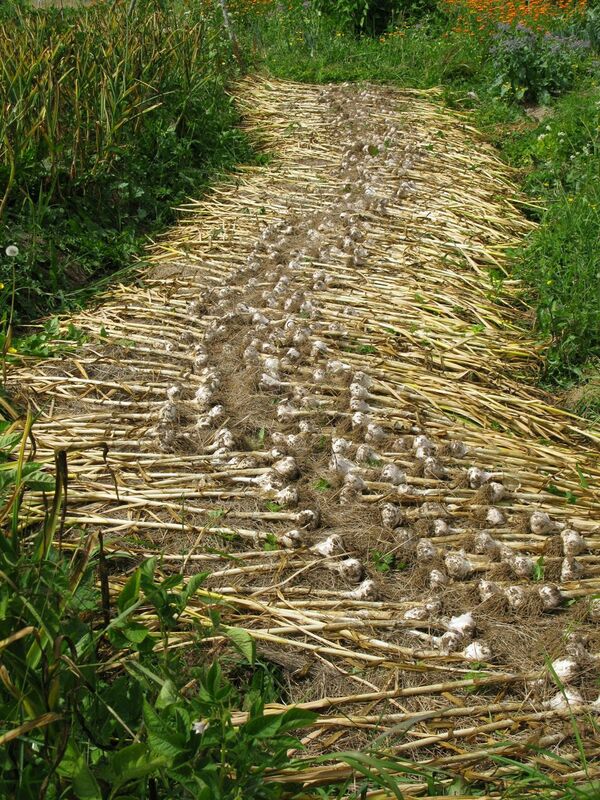 Garlic is one of the easiest crops to grow if a few simple steps are fallowed. I shall attempt to outline my process of garlic cultivation, a system that has evolved over the last 15 years to where it is today. The best time to plant Garlic is in the fall before the ground freezes hard but after a few light frosts. I plant between late October and late December depending on that years seasonal conditions. You can also plant late Winter or early Spring but the head size and storage quality will not be as good. Planting garlic begins with acquiring good seed stock. We select our seed bulbs from our last harvest. Selecting the biggest and best examples of each variety, generally that amounts to 10-15% of our harvest. In this way we have been able to improve the quality of each variety over the last decade. Garlic is grown by planting a clove taken from a head of garlic. This is an asexual reproduction, a clone or divide from the mother plant. You can also plant garlic from the little Bulbuls that develop on the flower tip of the garlic plant providing you don’t cut the scape off. 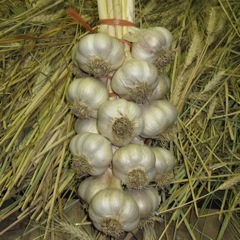 This will result in a cross pollenated garlic variety and is a sexual reproduction and a way to create new varieties. Planting the Bulbuls will take about three years of growth before you will get a head that starts looking like garlic and divides into cloves. For this reason most people plant full sized garlic cloves and get a full sized head when harvested in one season. it a micro terrace to the South to help the bed warm earlier in the Spring. This has the added benefit in our situation of allowing rain water to run off on the up hill side of the bed where it will soak in as it runs into the path. After the bed is completely shaped we will often spray a biodynamic preparation of barrel compost and horn manure to enliven the soil life force and help build humic acids and water holding capacity within the soil. After the bed has it’s final shape the cloves are planted. As a Biodynamic farm we always plant and harvest storage crops on the appropriate day in the biodynamic calendar, so for garlic we wait for a root day. We find that this insures the best quality, flavor and storage properties. We use the Stella Natura Calander. Over the years the spacing of my planting has tightened up considerably so that I can get more garlic in less space without compromising quality or size. These beds are planted on a 6″ staggered row bio-intensive like spacing. To be clear the cloves should be pushed into the ground so just the tips of the cloves are visible and they are in a 6″ equilateral triangle so that each row is slightly less then 6″ apart. In a 4′ bed I can usually get 10 to 12 “rows” in the bed. So in a 50′ bed that adds up to about 500 – 600 row feet! Considering that a standard tractor cultivated bed gets 3 -4 rows down a bed, this is a much higher yield with less inputs. I have not seen any decreese in size or quality since I started planting with an 8″ spacing. The key is to have loose organic rich soil so that the garlic can set deep roots over winter. After all the bulbs are planted in the whole bed I use the back side of a leaf rake to bed in the cloves. This means that you lightly work the rake over the whole bed so that all the little divits where the cloves were placed fill in without disturbing any cloves. This leaves a smooth bed with just the tips of the garlic poking up. The next step is simple but oh so important. This is where you mulch all the beds down with a thick layer of organic matter. It can be hay, straw, leaves, grass clippings, animal bedding hay, or any other small to medium sized mulch that you can get your hands on. I personally use grass that I cut with a scythe so that it has long stalk and retains its loft as it decomposes over the winter. I put this on about 8″ to 1′ thick and by the time I harvest there is only about 2-3″ of organic matter left. This is one way we feed the soil, build soil and grow crops all at the same time. The benefits of the thick mulch layer is multi fold. First it protects the bed from the pounding winter rain that would compact the soil and erode the bed profile and leach the nutrients from the “A” horizon of the soil. Second it helps suppress weed establishment during the growing season. Third it helps retain moisture or even creates moisture during the dryer times of the year by providing a lot of surface area where water can condense every night when the air temp is cooler then the mulch temp. All of this means that you don’t need to weed, you don’t need to water and you don’t need to fertilize. All you need to do is prepare the beds, plant, mulch, harvest scapes,then harvest garlic heads! Leaving the bed ready for planting fall crops like carrots, Brussle sprouts, grains, rutabagas or turnips. I planted about 150 pounds of 9 different varieties last year. 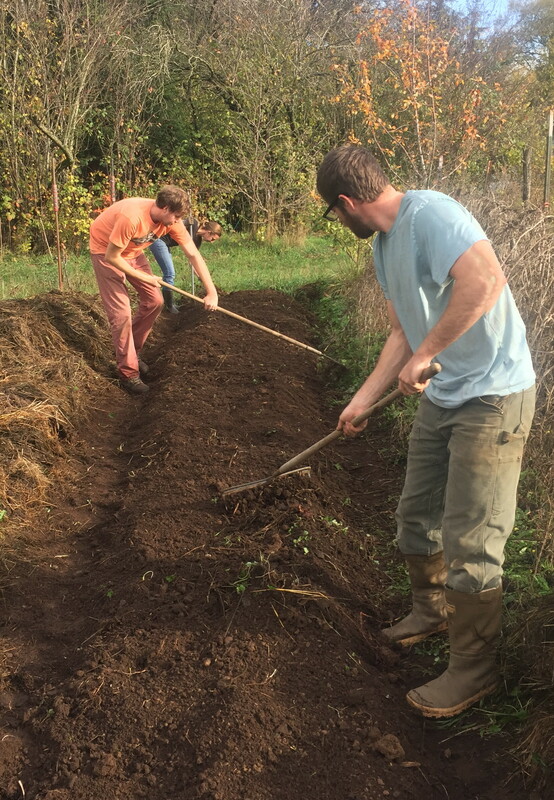 All our garlic is grown in raised beds using hand tools and manual labor. No chemical fertilizers or pesticides are used. Soil fertility is created by sound animal rotations, feeding the soil food web with organic matter and inoculating it with biodynamic compost. Feel free to call, email or stop by and see what I have . Garlic is best shipped in the fall. Quantities are limited, order before September 30th for best availability. We can ship within the continental US. Call 360-398-7061 to place your order. Known for 3500 years around the world for its healing as well as preventative properties, garlic is today being rediscovered by scientists; at last count, researchers have found that garlic contains over 400 different health-enhancing chemical components and compounds, a veritable all-natural pharmaceutical treasure chest. The breakdown of allicin in garlic releases the majority of the many chemical components of garlic, particularly by crushing or chewing raw garlic. Powerful sulfur compounds in garlic kill and inhibit an astounding assortment of bacteria, viruses, fungi, mold, parasites and worms, frequently on contact. They also work within the bodies vital systems, such as the circulatory, digestive, immunological, to promote detoxification, cleansing, lowering blood pressure, strengthening the immune system and healing. All in all, garlic helps promote good health.